WTI trades above $57 per barrel at the start of the Asian session on Monday. 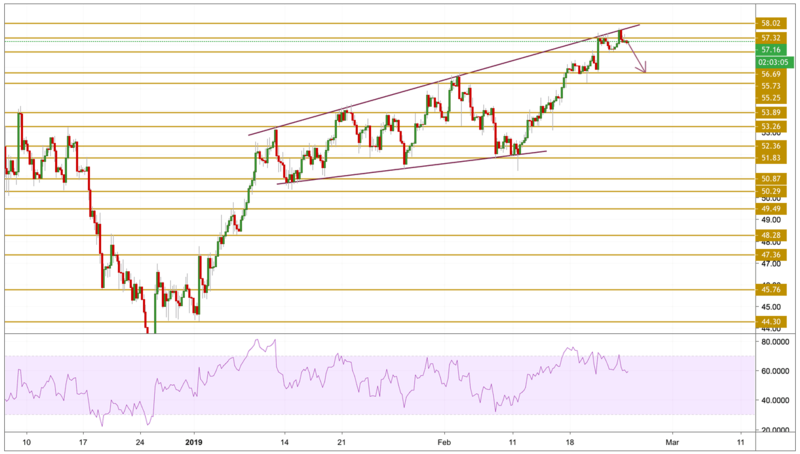 The Crude oil benchmark posted gains for the second consecutive week as optimism surrounding the US-China trade deal favored increasing demand in the future. Adding to the positive sentiment was Friday’s weekly Baker Hughes oil rig count data that mentioned the US operating rigs declined for the first time in three weeks. While expected trade-deal between the world’s two largest economy is likely to reimburse prior losses due to the trade protectionism, improvement at demand-supply can help direct the prices upwards. Crude price printed another fresh high on Friday reaching $57.79 per barrel. However, the price failed to settle on top and retreated towards the $57 level, as the momentum seems to be exhausted. We can clearly notice the divergences between the momentum and the price that points towards a downward move. Even though the fundamentals are bullish, but we expect a technical correction in the prices, and the level we will be focusing on is the $55.73 support level.